Modest Mouse has a new record out this year, plus they've gone on a pretty extensive reissue campaign over the past few months. As I didn't really have any Modest Mouse vinyl, I figured this would be a good time to start picking up everything else since it's the first time in decades most of this has been readily available. So, for the next few weeks, we'll have Modest Mouse Monday. I'm going to do the records chronologically and first up is This Is A Long Drive For Someone With Nothing To Think About. I can't say this has ever really been my favorite Modest Mouse album. I'll admit to not really getting that into the band until they had released The Moon And Antarctica. That was the first record that really made me pay attention to this band and I think part of that may have been that I found their earliest music a little underwhelming when I had first heard it. I can go back to this record now with fresh ears and I was wrong to completely dismiss it. There are moments that are very strong. Songs like "Breakthrough," "Novocain Strain" and "Exit Does Not Exist" are obviously great songs and real standouts on this record. But there are a few too many long, slow songs that I don't think have quite as many interesting ideas in them as the band was able to produce in later years. It's a good record, but I just don't think it will ever get quite as much play from me as the rest of their catalog. The pressing itself is very nice. I paid the few extra bucks and ordered my copy from Newbury Comics. 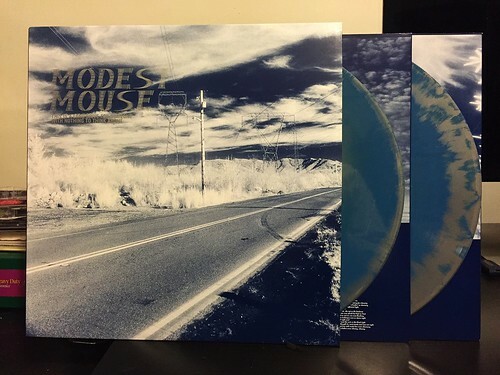 Their version was limited to 1000 copies and the exclusive was the blue and silver haze vinyl. I think it looks really sharp and completely matches the artwork, so even though it was a little more expensive than the black vinyl, I think it was worth it. Additionally, it sounds fantastic. I don't have an original pressing to compare it to, but I think this reissue sound great and it's worth picking up if you've been on the fence.